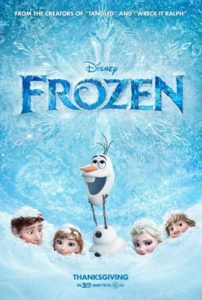 Refashioning Hans Christian Andersen’s The Snow Queen, Walt Disney Pictures returns to the animated musical with Frozen (not to be confused with the 2010 winter survival film of the same name), a lushly animated storybook laden with a few modern twists. 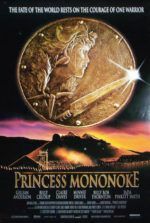 The film marks an evident attempt to rekindle the studio’s 1990s heyday of fairy tale romances set to song, like their other Andersen adaptation The Little Mermaid. And their efforts come close to a complete triumph, save for the hints of desperation behind its construction. Every detail in Frozen, from the characters to the environments, has been painstakingly engineered for mass appeal, resulting in a subtle transparent quality. To be sure, it’s all expertly assembled on a technical level, offering an almost textbook Disney experience for youngsters both visually and thematically. However, in spite of everything Frozen gets right, it ironically lacks a sense of warmth. Frozen has been in development at Disney for over a decade under various directors, writers, and songsmiths (among them Beauty and the Beast screenwriter Linda Woolverton and lyricist Alan Menken), all who tried and failed to make Andersen’s iconic story relatable. 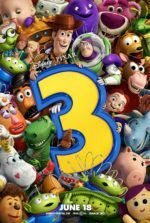 With the ever-welcome influence of producer John Lasseter, the Disney team finally agreed on long-debated character arcs and the troubled production found its legs under Chris Buck and Jennifer Lee. Helmer of Disney’s Tarzan, Buck co-directs alongside Frozen’s screenwriter Lee (co-writer of Wreck-It Ralph), who’s now the first woman director of a Disney feature. For the musical aspect, eight songs are performed in a Broadway style, making the picture ripe for a stage adaptation. Christophe Beck scored the music, while Kristen Anderson-Lopez and Robert Lopez wrote the lyrics. The songs, while serviceable and occasionally charming, won’t leave you humming them when the show is over. ,This tale of sisterhood follows Elsa (Idina Menzel), princess of the pseudo-Scandinavia kingdom of Arendelle, and her younger sister Anna (Kristen Bell). In childhood, Elsa’s uncontrollable magical ability to create ice and snow struck Anna and wounded her, and henceforth Elsa vowed to keep herself locked away, never to express the emotions that spark her dangerous powers. During her coronation, Elsa’s strict manners give way to an icy outburst and she flees the kingdom in fear of doing more harm. Meanwhile, Anna has fallen in love with the duplicitous Prince Hans (Santino Fontana), but she must set out to find her runaway sister, who has unintentionally unleashed a permanent winter on Arendelle. Along the way, Anna teams up with a rugged ice trader Kristoff (Jonathan Groff). Together Anna and Kristoff head to a nearby mountain, where Elsa has built herself a new icy fortress of solitude, to convince her to come home. Disney is famous for inventing cutesy side-characters to enliven a standard fairy tale, like the mice in Cinderella or the talking dragon Mushu from Mulan. Here there’s no shortage of throwaway comic relief as evidenced in the obnoxious Olaf (Josh Gad), the perpetually happy living snowman, or Sven, Kristoff’s trusty reindeer which behaves like a cross between a dog and a horse. Olaf has an amusing musical number called “In Summer” where, unaware that heat will melt him, he imagines how much he’ll enjoy the summer months. Sven has his moments too, mostly when he and Kristoff exchange dialogue, all of it spoken by Kristoff as he voices Sven’s reactions (particularly amusing for pet owners who create voices for their animals). Nevertheless, neither character has any consequence to the narrative, and both exist primarily to make the kiddies laugh. Worse than any annoying comic relief is the writers’ persistent use of teen slang in the storybook dialogue. There’s plenty of “like” and “totally” and “awkward” phrasing that feels out of place in this setting and period, frustratingly included if only to connect with contemporary crowds. Few could argue that Frozen looks anything but beautiful, the frost-touched landscapes of snow sparkling with bright hues and glittery, crystalline twinkles. Disney animators have perfectly captured the textures and lighting effects of snow and ice (this coming from a lifelong Minnesotan). If only the characters were as thoughtfully rendered. Elsa and Anna, in particular, look like boring plastic dolls with their heart-shaped heads, oversized eyes, undersized noses, and impossibly slim figures. Other characters have a dull quality too, such as Olaf, whose buck-toothed cartoonishness is completely out of place here. And then there are the trolls. Kristoff, as it turns out, was raised by a large family of rock trolls, who look like stony versions of your standard troll doll—short, pug-nosed, half-circle eared creatures with frizzy green moss coiffures. Sadly, these characters never live up to their marvelously detailed settings. Frozen veers far enough away from the source material to avoid being described as “classical”, yet contains a somewhat traditional fairy tale narrative structure. 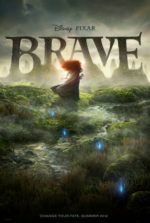 The film feels like a reaction to the utter banality of Tangled and the stark revisionism of Pixar’s Brave, and tries to find the viewer somewhere in the middle. While trying to please everyone, Disney speaks to the lowest common denominator instead of setting themselves apart. Young children won’t notice, of course; they’ll be laughing at the silly snowman and awed by the shimmering animation in 3D. And they should be—they’re the target audience. Adults, when not rapt by the gorgeous environments, will recognize familiar elements from a legacy of Disney fables. Indeed, Frozen is a repackaging of timeworn ideas that demonstrates a faint desire to be something more, but instead, resolves to be a safe moneymaker. The question becomes one of how you judge a success, by how pleased your children are with the result, or how much everyone in the family enjoys it? Suffice it to say, the kids will be pleased.